Request forms are important pieces of the document which suffices as a formal way of making requests and also assists in documenting the request process as well as the series of circumstances which may or may not place because of this request. 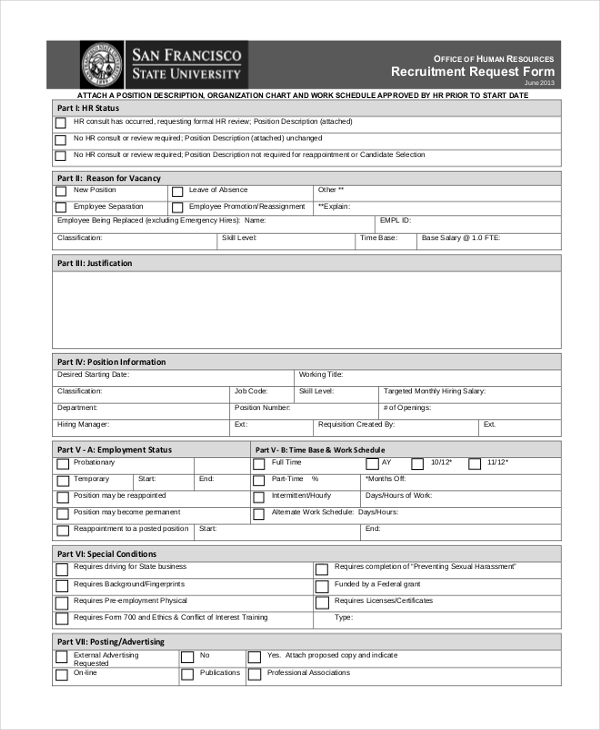 Request forms are used by employers and employees in business organizations as well as teachers, students, and parents in educational institutions. These forms have considerable documentation value and may be filed and preserved for compliance reasons. 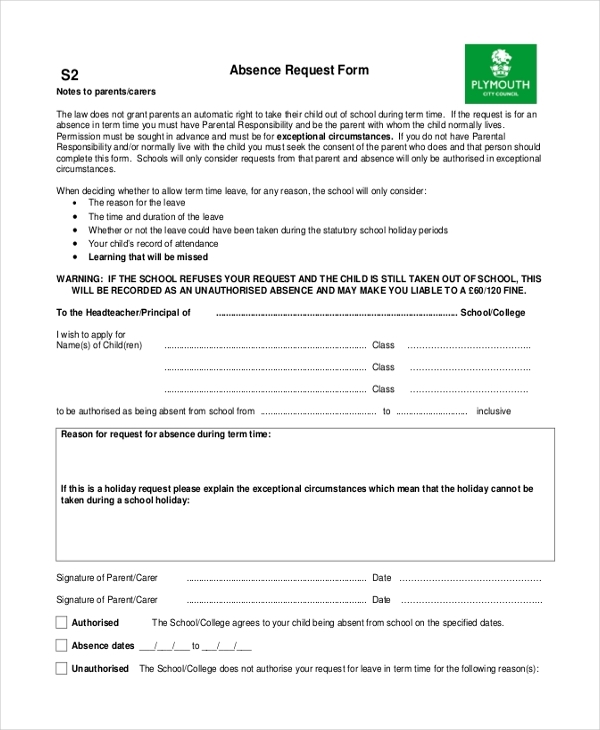 This form is exclusively used by parents to seek permission for the absence of their child from school for one or multiple days due to exceptional circumstances. The form contains space to clearly enumerate the reason for the absence. Every newborn should have a documented birth certificate enumerating the date, time and venue of the birth of the child. 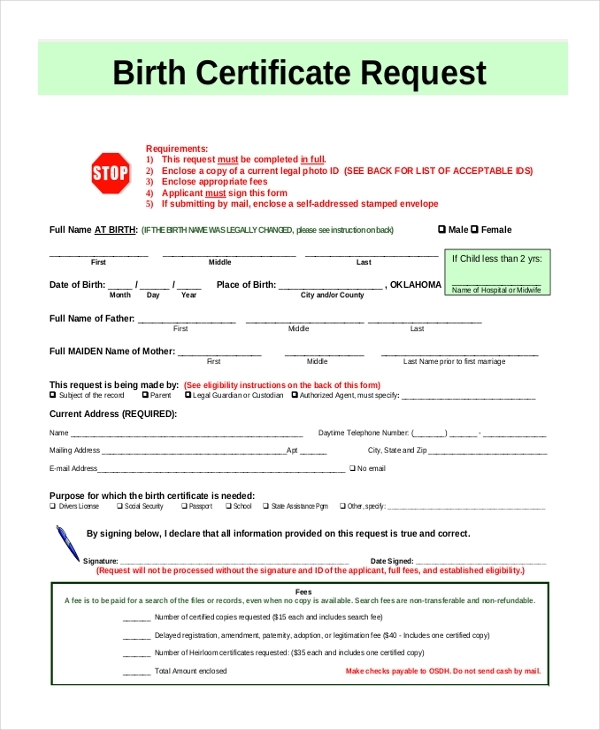 This form is a useful document requesting to issue a birth certificate form for the child. 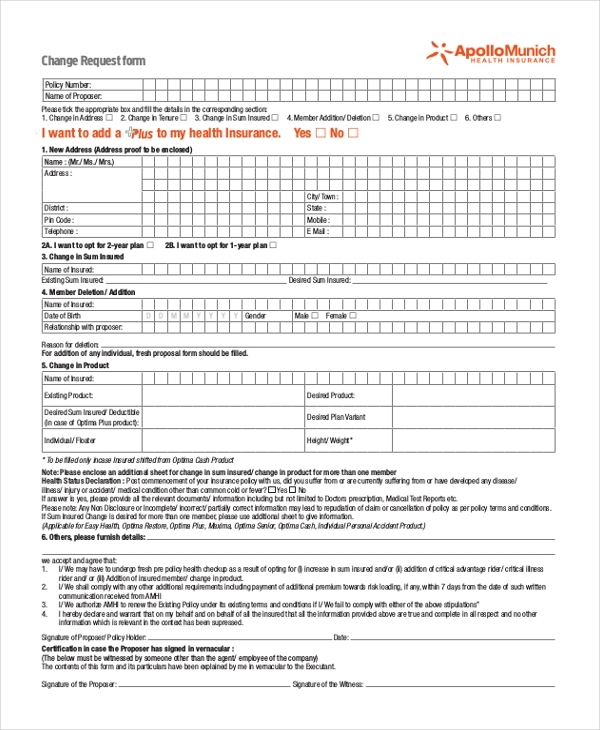 If you are looking to introduce a change in your health insurance such as the insured amount, tenure or premium, you can use the change request form to let your financial organization know about your intentions. 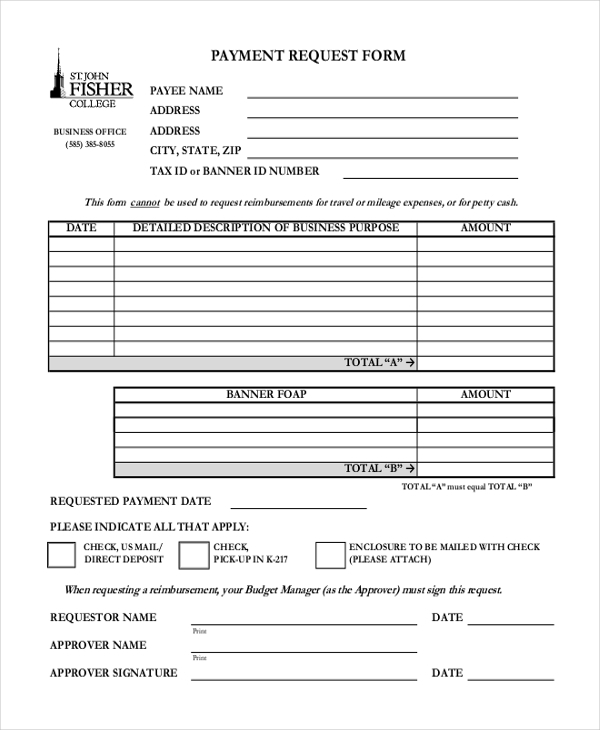 Check Request forms are used to create accounting transactions that require a payment to be issued. 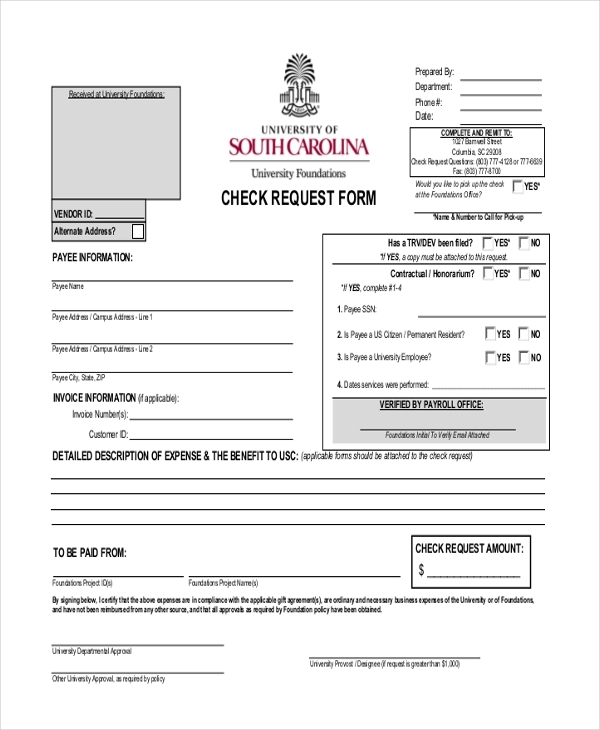 You can typically use this form to issue refunds, payment from a clearing account or reductions of revenue. 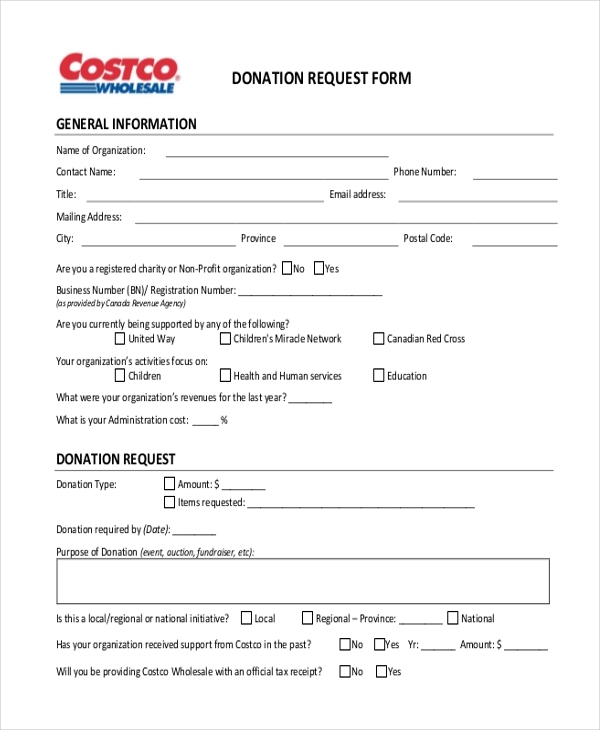 The Donation Request Form can be utilized to document the details of donation that have been made towards a charitable organization. This documentation is needed to support your income tax return based on the amount given and also the type of property donated. 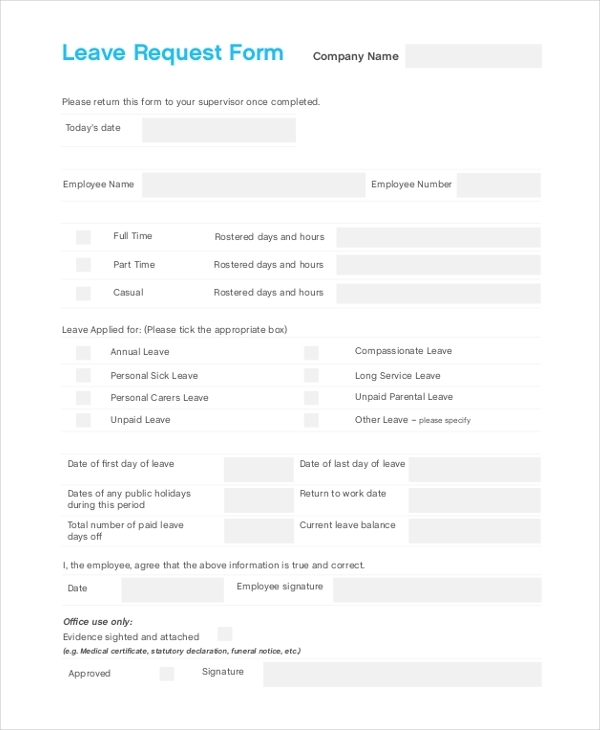 You can use the Leave request form to let your supervisor know the details of a leave you wish to take from work. The form contains the date of the leaves to be taken, the reason and the contact details required during the absence. Should your building require any maintenance work, the Maintenance request form can be filled in so that you duly receive assistance from the respective department within a stipulated time. 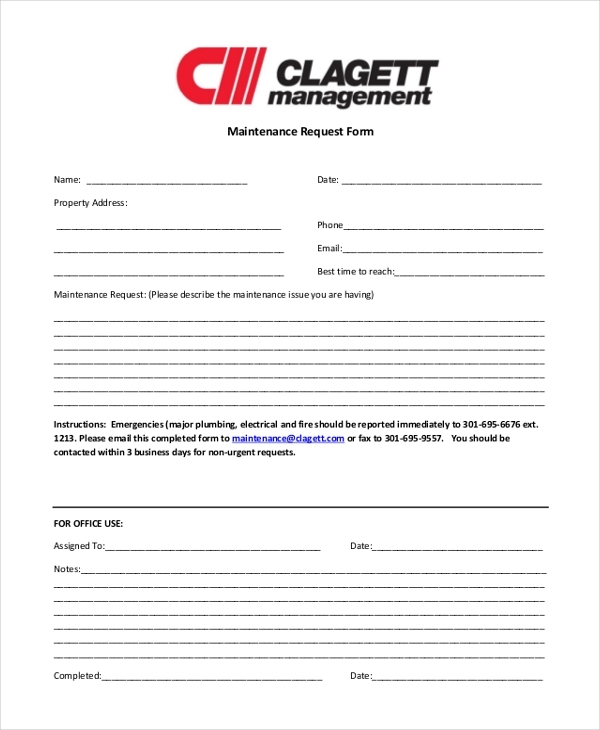 Marketing request form is used to request the development, creation, or revision of any marketing or communications materials of any business enterprise. This form highlights the date of the request, the purpose of the request and the target audience among other important information. 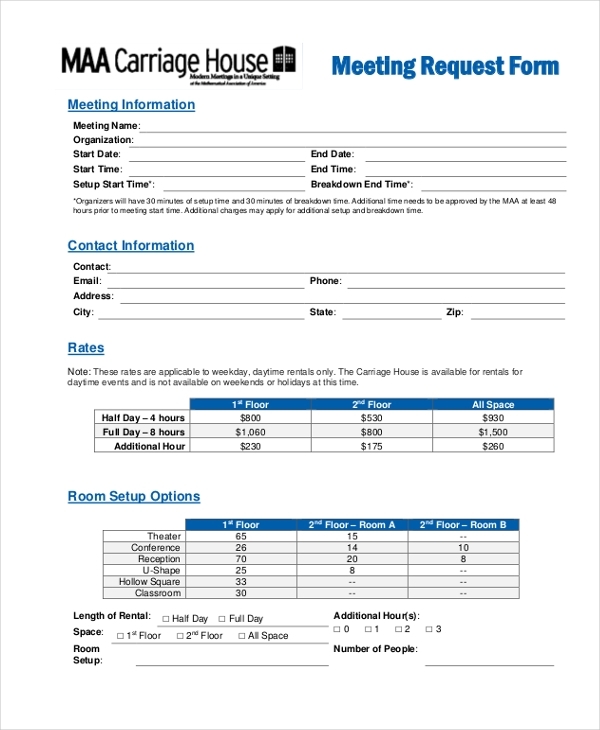 Meeting request form is used to intimate the organizing department about an intended meeting which is to be conducted in a conference room. This form also provides scope to key in other important information such as the room set up directions and requirement of audio and video facilities. 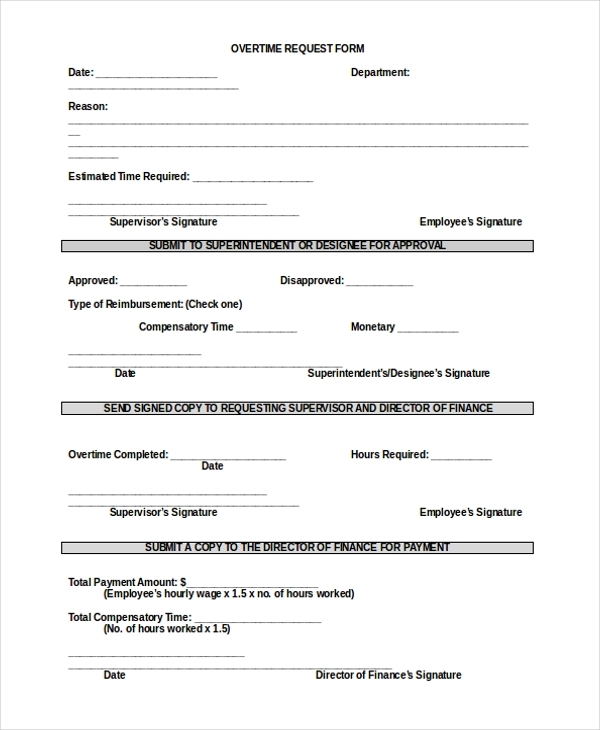 If the managers require their team to work overtime, upon their consent an overtime request form can be shared with everyone who can input their respective extra working hours detail which can be collected and documented for filing and paying purpose. 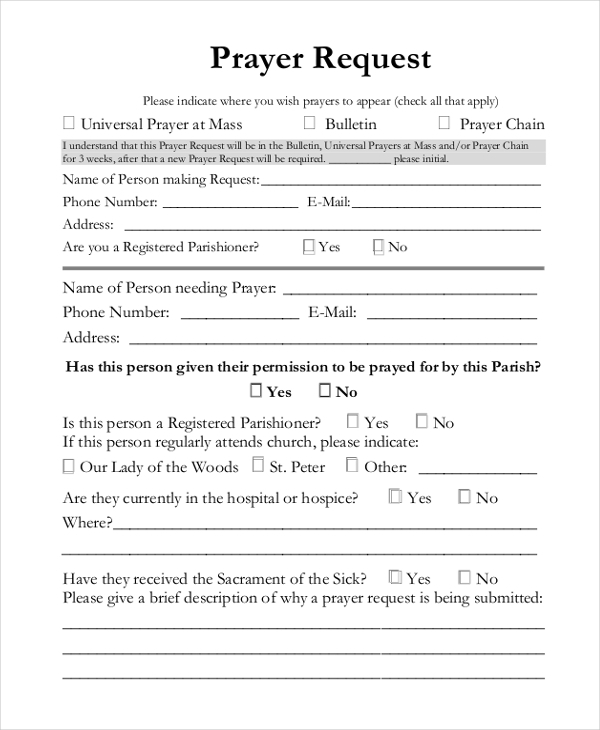 This form is used by members of the church to make requests at the time of prayers and masses in the church for an individual and the reason explaining such a request. Payments can be requested against the receipt of products or services rendered and this can be done with the help of a payment request form which not only contains the payment details but also the detailed description about the purpose of the business. 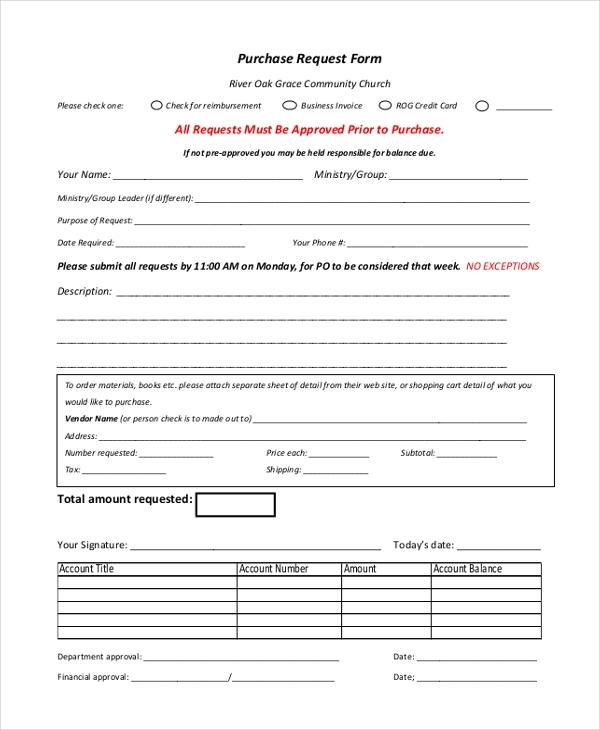 The Purchase Request form can be used if you are looking to purchase books or commodities from a seller, many of them maintain that you fill in a purchase request form for them to keep a track of the transactions. Recruitments are an important aspect of business enterprises and therefore, this form can be used to request recruitment for a stipulated position. This form can be used to document the formalities involved in the process. 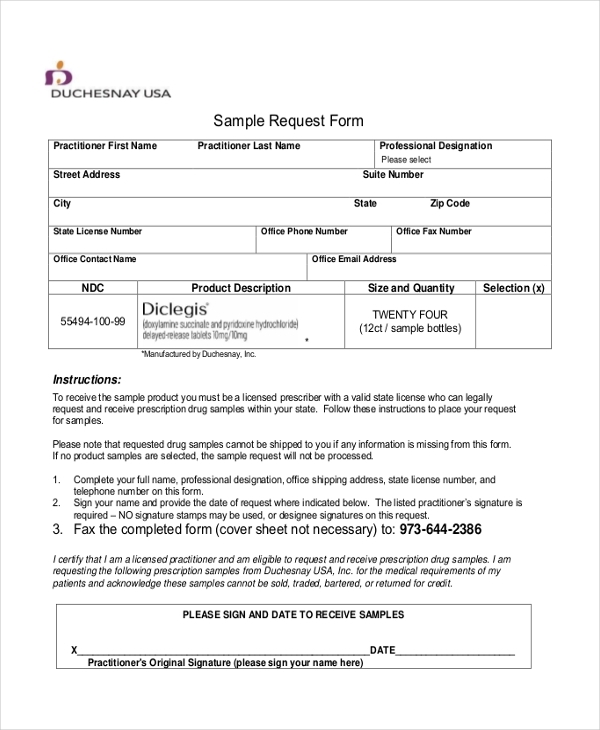 Sample request form can be used to request for the inspection of a sample i.e. a product, a drug or a commodity, chiefly for business purposes like testing, documenting and reporting. 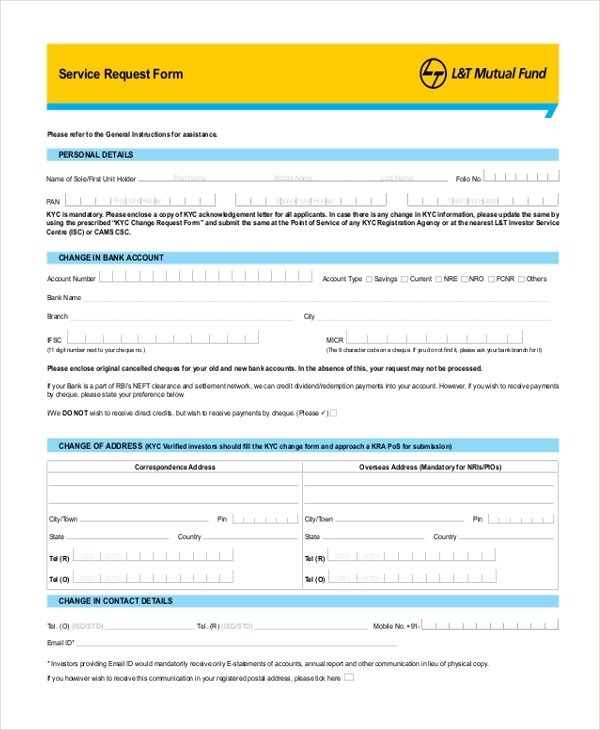 If you are looking to change your name, surname, banking credentials or other relevant information with your bank, you might have to fill in a service request form such as this to intimate them about your desired change requests. 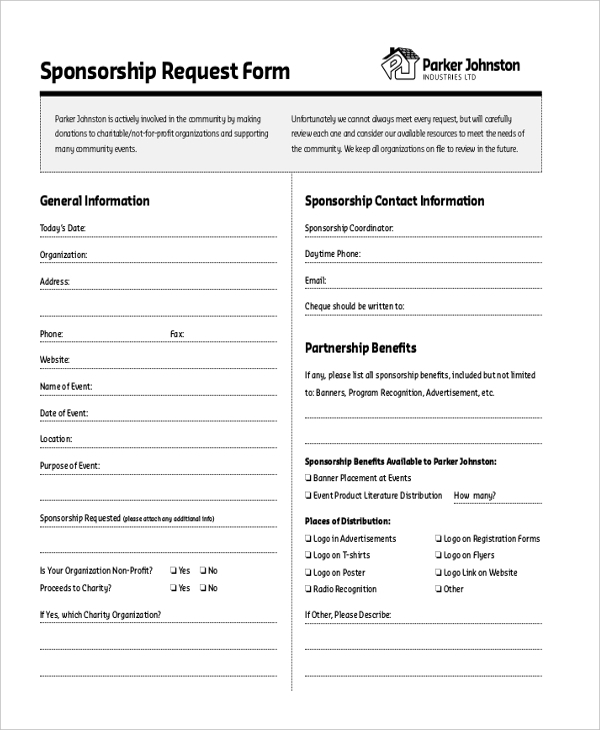 You can apply for the consideration of sponsorship to a business or non-profit organization by filling in the Sponsorship Request form and furnishing relevant details like the partnership benefits and details about why you require a sponsorship. A training Request form is furnished to a specialized training department by an Operations department in a company highlighting the individual or the team’s needs for specific training and describing the aspects of the required training. 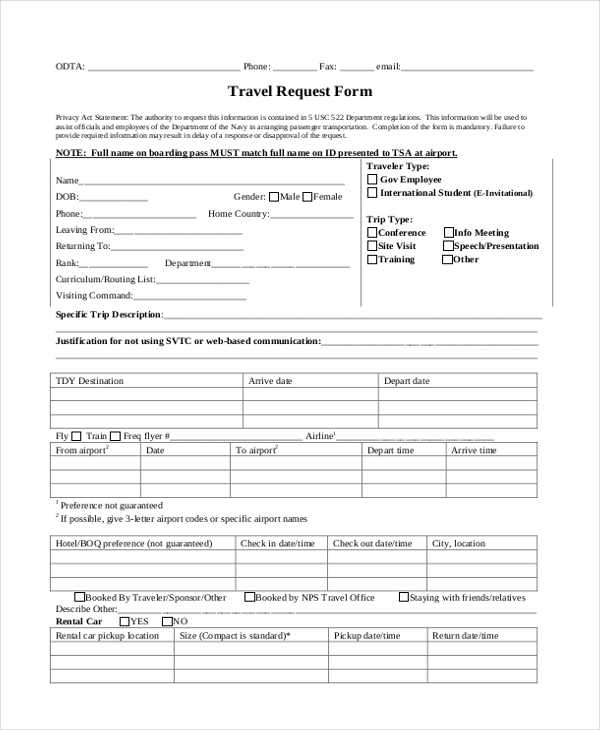 This form is exclusively used by employees to request a booking for traveling for business. The form provides an area to document the business purpose, dates and location and details of the intended travel. 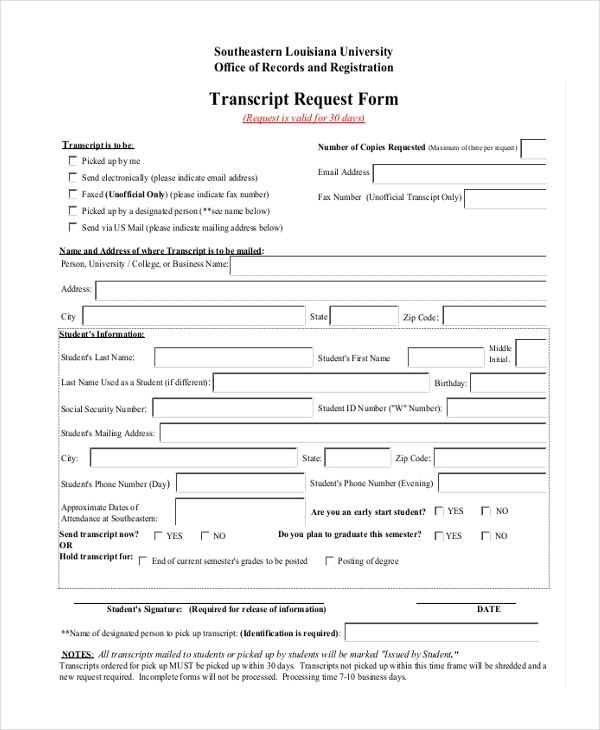 Students can request transcripts from their respective universities by using the Transcript Request form which includes space for the student information as well as details about how the transcript is to be collected. 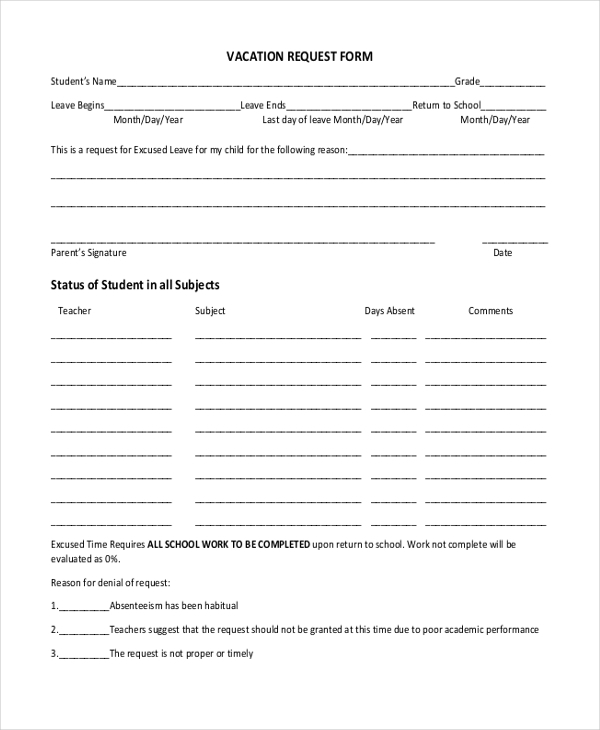 Vacation request form is to be filled in by parents to inform the school authorities about taking their child away on holiday for a considerable time period. This comprehensive form records the details of the curriculum the child will miss along with relevant teacher’s comments. How to use the Request Forms? Request forms have myriad usefulness. You can use these forms to request service, samples, feedback, maintenance, leave, vacation, allowance, sponsorship, specialized training and make numerous other requests. Request forms are also used to retrieve user information from forms and file the requests irrespective of whether they are being complied with or not. Request forms are the proof of an intimation placed by you and tracks whether the stipulated request has been closed or not. A request is considered official and valid when it placed in a written format enumerating all the required details. They can be filled in either digitally or manually. What are The Benefits of Using The Request Form? Forms serve the purpose of office and even today paper forms are still viable to business in the modern age. A request form is a formal way of making, explaining and validating a request. Request forms are considered to be business documents which suffice for a professional document and ensures that a request is granted status by virtue of the details of the form. The booming of the Internet and the resultant explosion of e-commerce in both business and consumer categories are largely fuelling the needs to create and fill request forms. They also build bridges between departments and promotes the development of a cordial relationship. With every passing day, forms are becoming compact and smart. Therefore it is imperative that you create a similar document which is capable of making business communication on your behalf. 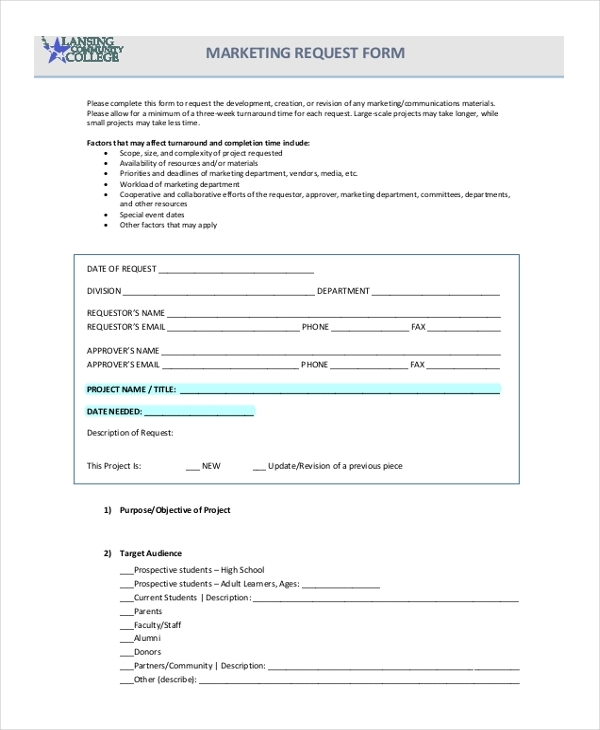 The request form templates available at sampleforms.com are a neat set of documents you can download and customize to create crisp business request forms.